Contact a Handyman in London through Us Now! 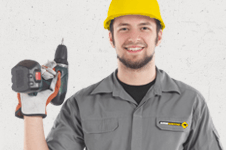 Don’t hesitate to contact a London handyman now on 020 3746 0607 for a free quote over the phone, or to get a free, instant and accurate estimate here on our website – we have an instant web chat support facility and an online booking form through which you can find London handyman services with ease. You will experience the very pinnacle of home maintenance services at a marvellous rate, and have the chance to ask our friendly and knowledgeable customer advisory team any questions that you might have at the same time. Our lines and chat support are open and fully staffed 24 hours a day, 7 days a week, so call whenever you need to. And remember: when you make multiple bookings at the same time, you can receive a discounted rate on any combination of our excellent services!